There’s something that I want you to know. Sometimes, I can be an absolute disaster in the kitchen. The first time I tried this recipe, it went off without a hitch. It’s a pretty darn easy recipe, so it should go off without a hitch. Every time. But sometimes there’s no explaining me in the kitchen. 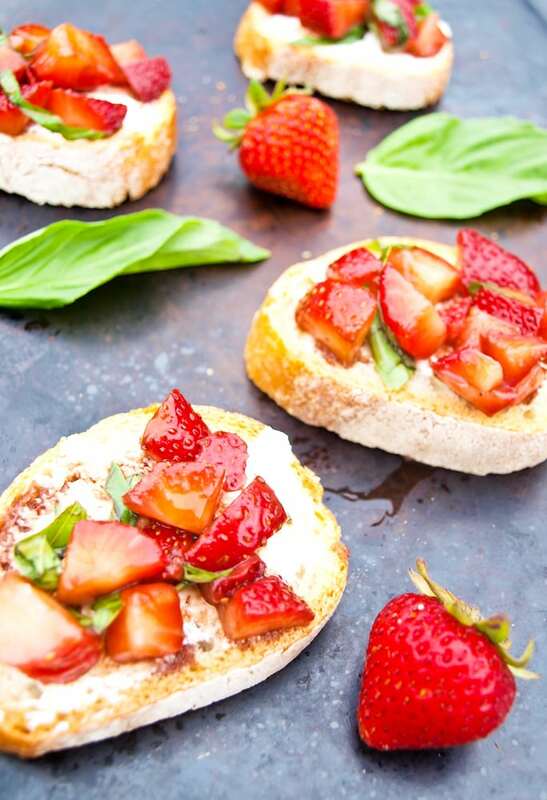 When it was my turn to bring a snack to my monthly book club, I thought this summery strawberry bruschetta would be a perfect choice. It was quick and easy and I could whip it up after dinner in time for the 7 o’clock book club. It was about 6:35 when I started making the bruschetta. It’s a neighborhood book club, so I only had to travel down the street. Plenty of time. Then, I burned my first batch of toast. Luckily, I had more bread. No sweat. Maybe I’ll be five minutes late, I thought. Keep going. Next, I burned my balsamic reduction and had to start over. It didn’t help that Meghan and Luke were chasing each other in circles around my legs, but still. I was more than five minutes late. I tell you this so you know my tagline’s descriptor, “an everyday mom” is very true. I want everyone who reads here to know that I’m just a regular mom trying to feed my family well and you can definitely do the same. Probably with a little more grace than me. While it took a little longer than it should have, I did make the bruschetta that night and everyone at the book club loved it. When I bring a dish to an event, I judge its success if anyone asks for the recipe. Three different ladies asked me for the recipe, so I called this one a winner. If you need a quick, easy, and delicious appetizer for all your summer get-togethers, this is your recipe. My kitchen disaster aside, this really is an easy dish. And even better, it’s oh-so-delicious. 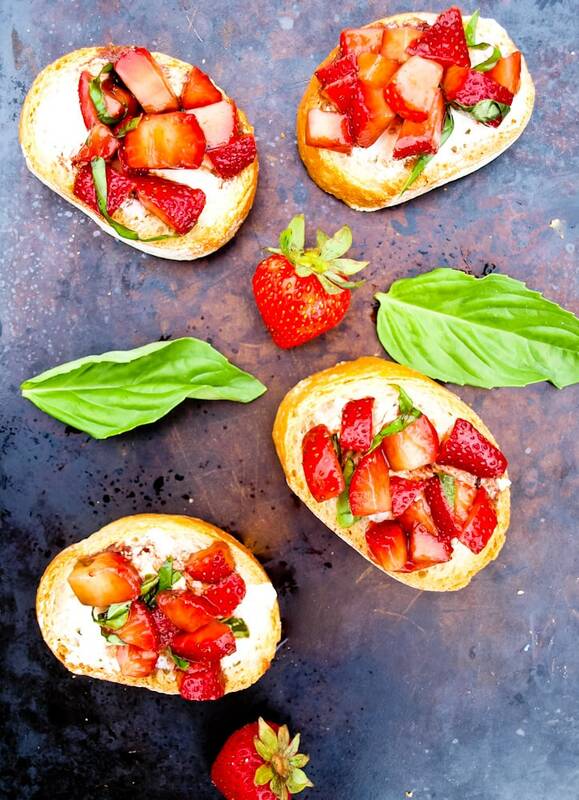 The flavors of the tangy goat cheese next to the strawberries covered in a balsamic reduction with fresh basil just work. Everything compliments each other and there’s a perfect balance. This will be my go-to appetizer anytime I need a dish to bring to gatherings this summer. It should be yours, too. This light and summery appetizer is a fun twist on the classic bruschetta! It’s quick and easy to make and always a crowd pleaser. In a small sauce pan, bring the balsamic vinegar to a simmer over medium high heat. Reduce the heat immediately and allow to low simmer for about 10 minutes, until it is reduced by about 1/3 and slightly thickened. Remove from heat and allow to cool. In a medium bowl, combine the diced strawberries, vinegar reduction, and basil. Add salt and pepper to taste. Set aside. Spread each slice of bread with some goat cheese. Top with a portion of the strawberry mixture. Enjoy! I love anything with strawberry! Gorgeous pics! OMG this is the perfect summery combo of fresh flavors–definitely trying for my next get together! Oooh that sounds like a fabulous idea! Looks so delicious! I love strawberries and basil AND goat cheese! LOVE this! Just added to my NYE round up! !